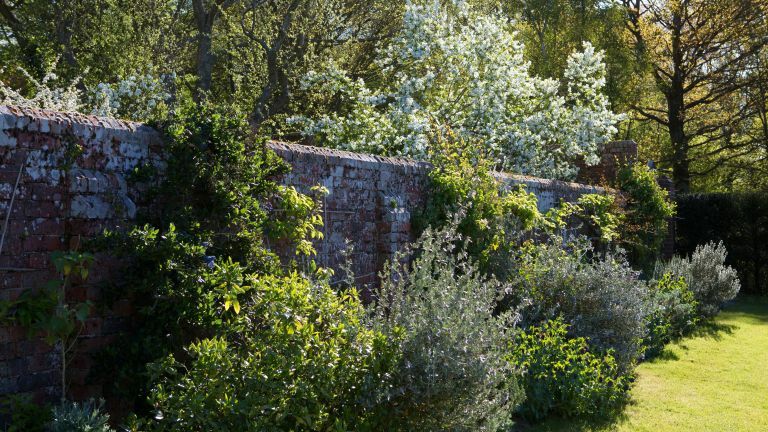 It took 25 years for the owners to transform this terraced garden from a state of wilderness into a series of beautiful areas, in the process making some exciting discoveries, including a walled garden and an ancient bluebell wood. ‘When we arrived in 1994, there was no garden to speak of and we didn’t know there was a walled garden flanking the eastern façade of the house until we discovered it when clearing a thicket of undergrowth in our first winter,’ says Peregrine Massey, who lives here with his wife Deirdre. See what they did next, then check out more real home transformations and find out how to plan, design and cost your garden transformation. The stepped gardens surround an Arts and Crafts-style house that was built in 1902 at the top of a south-facing hillside, on a small private estate near Woodchurch on the eastern fringe of the Kentish Weald. The gardens enjoy stunning views and are a delight to wander through. ‘People always think taking over a wilderness must have been a nightmare, but I can think of no better starting point for creating a new garden; infinitely preferable to taking over someone else’s idea of perfection and studiously setting about maintaining it,’ says Peregrine. A tour of the garden will take you through a series of loosely divided rooms as well as an atmospheric woodland walk. The formal areas in contrast with the natural setting make for a glorious landscape to explore, full of fresh greens, brightly coloured tulips, blossom and a sea of violet-blue. Fragrance fills the air. Bordering the garden is the extensive ancient woodland with meandering paths that wind through the carpets of woodland anemones followed by the magical bluebells. ‘The woodland is principally down to oak standards with hornbeam, hazel, sweet chestnut and avian cherry underwood; and we have introduced a coppicing regime that enables us to put in place a cycle of renewal that should be fully sustainable into the future,’ Peregrine explains. In April, highlight plants include delicate snowy white blossom on Amelanchier lamarckii, clouds of pink prunus, and the unusual ornamental shrub, Staphylea colchica, with its fragrant creamy flowers, and its even rarer relative S. holocarpa ‘Rosea’. Visitors can explore the transformed walled garden where the sheltered microclimate supports southern hemisphere and semi-hardy plants, including Ceanothus (Californian lilac). There is also a camellia dell, herbaceous borders, a flame bed, an Italian garden, a garden to celebrate the Queen’s Diamond Jubilee, a vegetable garden, a wide variety of old-fashioned English roses and an Elizabethan herb garden. Find out how to create your own rose garden in our guide. Lending structural formality are a pergola walk, lines of hedges, architectural foliage from phormiums, repeated clipped shrubs such as Photinia x fraseri ‘Red Robin’, and defined paths. Find advice on adding pathways in your garden. Bluebells need sun in winter, then dappled shade, and soil needs to be rich in rotted leaf-mould. Plant drifts of native bluebells, Hyacinthoides non-scripta, under deciduous shrubs or trees. They will naturalise to form a dense carpet. They do best under native beech or hornbeam and look wonderful under ornamental cherries. Plant some ferns (Dryopteris) with bluebells, to give a natural feel. They will unfurl at the same time. Make a mini path through them. Never take bluebells from the wild, as they are protected by law. Many nurseries now stock them, but do check they are labelled Hyacinthoides non-scripta and where they were sourced from. Plant bulbs in autumn, or ‘in the green’ in spring. If you have a bluebell wood nearby, don’t plant Spanish bluebells in your garden as they may invade the woodland and take over the native English version. Add some other blue bulbs in the garden or in containers. Try Muscari armeniacum, Scilla siberica, Chionodoxa forbesii, Anemone coronaria, Ipheion uniflorum and Iris reticulata. Expanses of blue give the illusion of more space.